The "Beast of Gevaudan's" identity explored, could it have been a Thylacine? 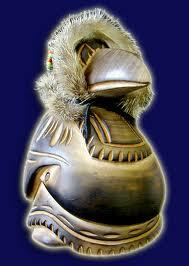 Deity of the Day- Kutkh is a raven spirit revered by the indigenous peoples in far east Russia. Kutkh appears in many, often contridictory, legends. He is a key figure in the creation of the world and the "Fertile Ancestor" of mankind. A mighty shaman and trickster, Kutkh gave man light, fire, fresh water, language and net weaving skills. Alternately, he can be theiving and selfish. It is said that Kutkh created the peninsula of Kamchatka by dropping a feather. It's volcanos represent the burning hearts of men who fell in love with the first woman. Kutkh, the Raven God. Large wooden carving depicting the head of Kutkh.